What's the Best Drink to Recover After Sports or Exercise? So let’s get straight to the point. There is a far better way to replenish lost fluids than drowning yourself in toxic colorings, chemical additives, and ridiculous amounts of fake sugar like Gatorade or Powerade. The commercial lied to us beautifully when it told us impressionable moppets that we could “be like Mike” if we sucked down a Gatorade after a workout. Since then, more and more drinks claiming to replenish fluids and electrolytes have been marketed to us in this fashion. 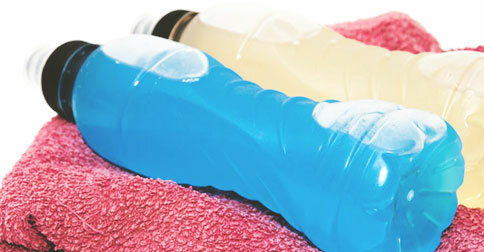 Hydrate before, during and after strenuous physical activity. Electrolytes turn on all thought and motion, almost like a wall switch. They trigger all events like muscle action by controlling ion channels. Ion channels are the gates that open and close to move life support material to and from cells in the body. Say for example, you want to start running. Your brain starts the signal that initiates a complicated series of timed muscle actions. Every sequence of that function is both timed and controlled by electrolytes. A better way to replenish the electrically charged particles needed to maintain fluid balance in the body and aid the muscle and nerve functions necessary for athletic performance: Pick up a spoon and fork. “Foods contain so many more electrolytes, as well as vitamins and other health-protective compounds,” says author and sports dietitian Nancy Clark, RD. Now we’re talking. You know we endorse whole foods at every turn. But this isn’t about finding foods to replace Gatorade; it’s about the convenience of a drink for competitive athletes. We’ll need two key components to replicate the claims of the big hitters: potassium and sodium, the electrolytes essential for muscle contraction and ones you lose through exertion and sweating. Oranges have the former, and the latter we can shake into a water bottle, so let us start there. Squeeze an organic orange and shake 1/2 teaspoon of salt into a large bottle of water. Boom. You have successfully managed the three objectives of a sports drink! Oh, and in the orange, you’ll get a healthy dose of Vitamin C for antioxidant protection and immune support in its natural form.